Fond of Jet Airways? Not really, right? Neither am I. But I have to confess that my last travel by Jet Airways was a very pleasant one - only because of the beautiful collection of thought provoking Shabana Azmi movies that their in flight entertainment housed. 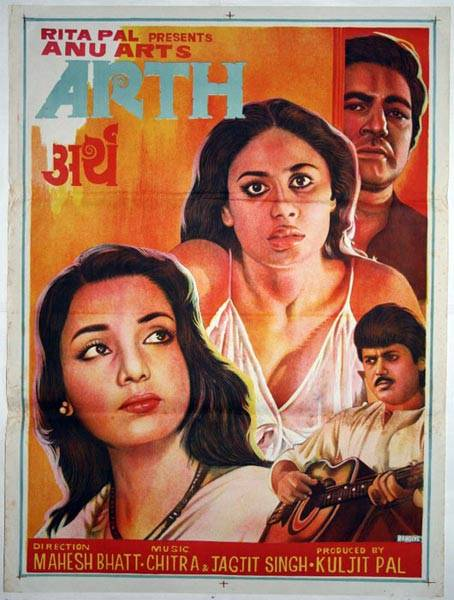 Out of the movies that I watched from the collection I would highly recommend movie buffs who enjoy intense cinema to watch Arth - a Mahesh Bhatt movie from 1982. Read the synopsis of this movie anywhere and you will mostly find it being described as a movie on marital infidelity - the story of a movie director's extra-martial affair with a top-notch actress. I however, believe that this description of the movie comes from the people who failed to uncover the innermost sheaths of the story. Those with a deeper perspective would describe Arth as a movie on a woman's search for identity, set in the background of marital infidelity - and when I say woman , I am not just referring to Shabana Azmi's character (Pooja) in the movie; I am also talking about Rohini Hattangadi's character (Pooja's maid) and also that of Smita Patil (the famous actress Kavita Sanyal). And this is not the only other way the story can be described. The layered story can be interpreted in so many ways and attaching a single interpretation would be injustice to the master piece that Mahesh Bhatt created. Infact, I am consciously not mentioning more about the story-line because I would want the viewers to get involved in the movie without any preconceived notions. You may ask, enough movies have been written on both the subjects (i.e extra-marital affairs and woman's self-identity) in the recent past, why watch a 1982 movie to explore the same subjects yet again? I would say, yes I agree, that the themes are rather the most exploited themes in Indian cinema but this movie is actually class apart. What sets it apart is Mahesh Bhatt's ability to bring to life the complex characters of the star cast, Shabana Azmi's flawless acting and Jagjit Singh's voice in Kaifi Azmi songs with the deepest meanings that set the mood just right. Every director or story writer always spends a lot of time sculpting the principal characters of the movie. Mahesh Bhatt, however, deserves appreciation not only for the attention that was given to the principal characters i.e the husband, the wife and the mistress but also for the way he has carefully crafted the characters in the side roles including that of the maid and of Pooja's admirer (Raj Kiran's character). For those of you who enjoy Bollywood gossip, this movie is claimed to be a semi-autobiographical work inspired by Mahesh Bhatt and Praveen Babi's real life love affair. Fashion mavens reading this article are also advised to watch the movie. It may be a 1982 movie, but take a closer look at Shabana Azmi's dresses and you will definitely be inspired sartorially. Her suits in the second half of the movie are as contemporary as can be. So watch the movie for some tips to glam up your ethnic wear.